Buddy Biancalana was born on Tuesday, February 2, 1960, in Larkspur, California. Biancalana was 22 years old when he broke into the big leagues on September 12, 1982, with the Kansas City Royals. 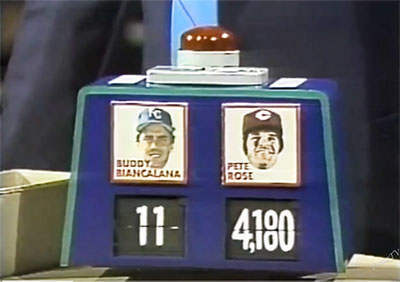 His biographical data, year-by-year hitting stats, fielding stats, pitching stats (where applicable), career totals, uniform numbers, salary data and miscellaneous items-of-interest are presented by Baseball Almanac on this comprehensive Buddy Biancalana baseball stats page. 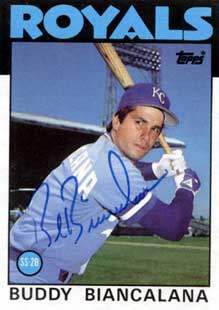 Roland Americo Biancalana was a Major League Baseball player for the Kansas City Royals Houston Astros (1987). Buddy, his nickname, was taken in the first round of the 1978 Baseball Draft , with the 25th pick, the first player ever drafted out of Redwood High School (Greenbrae, California)! David Letterman (Late Night, 11/06/1985) said, "Even though my next guest only batted .188 with six RBIs in the regular season, he is now one of the hottest names in baseball, he has been called the ultimate underdog, and with some very impressive performances on the field, he helped take the Kansas City Royals to the playoffs and into the World Series and a championship there. Please welcome my kind of ballplayer, shortstop Buddy Biancalana." In 1986, Buddy Biancalana discussed in a press conference, at length, what the off-season attention was like, and what he planning to do. "It's been flattering. It's an advantage to be recognized out in public. Sometimes it can be an aggravation. There are certain places I'll avoid going to at certain times of the day. But I try to accommodate everyone. I certainly don't want to come off being a bad guy. Being recognized wherever I go around Kansas City is a drastic change for me. I think that would be a big change for any person, have people watching you all the time. I have very little privacy now. That's the biggest change that really sticks out in my mind. The way people react to me has really been something. People really appreciate what I did, what the Royals did for Kansas City. It's a good feeling. It's flattering, especially to a player with my accomplishments, which aren't that great to this point. I didn't have a great season. But I did have a good World Series. I know I'm not going to slack off. And I've talked to some of the other players. They all plan to work hard. Winning was so much fun. We know the quality of the team we have, with our good young pitching staff we should be strong for a few years. We have to work hard, take it one day at a time. We can't go out, and expect that just because we're World Champions, we're going to win it. That just doesn't happen. It's not that easy. We caught a lot of breaks last season. It wasn't easy. I know a lot more people are going to be watching. There will be added pressure. But pressure's never bothered me. I think I showed that during the Series. I'm as far away from being a superstar as any player in the big leagues. I have a lot to prove yet."